I think I may be a tad too late to start this discussion as the winners were announced about a month ago. This year, we have three winners – J. Michael Kosterlitz, Duncan Haldane and David J. Thouless, all famous names if your research concerns solid state physics and the such. Anyway, back to the topic – Topology? According to Wolfram Mathworld, Topology is defined as “the mathematical study of the properties that are preserved through deformations, twistings and stretching of objects”. Hmm.. okay. So the properties are preserved? Cool, and then what? One research that topology has largely contributed towards to is the research on topological insulators. A topological material is basically an insulator that has conducting states on its surface. This is a research that might help(probably would!) in the implementation of quantum computers in the future. As someone who is not exactly an expert in quantum physics and solid state physics(a one-year lecture does not count! ), I dare not venture into the technicals of topology. 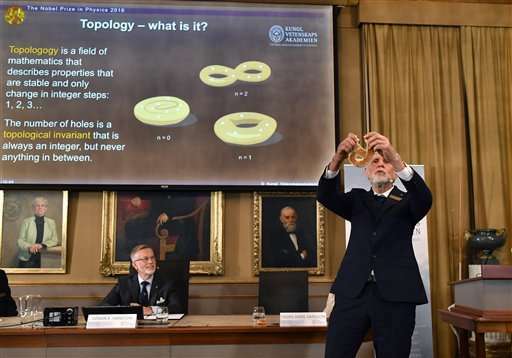 The Nobel Prize winner himself, brought a donut to the award ceremony so that us mere mortals can understand the principle better.